Doors made specifically for domestic and commercial garages. For the passage of vehicles. A door that is opened by tilting up and overhead on spring loaded pivots sometimes assisted by pulley and counterweight. 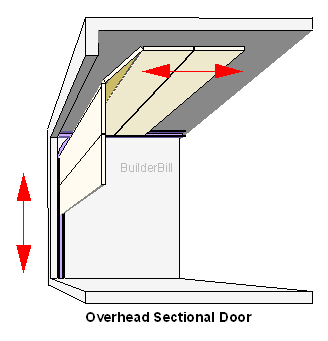 Above is a sketch of a steel roller door which is suitable for small to industrial sized sheds. See the next page for more details. 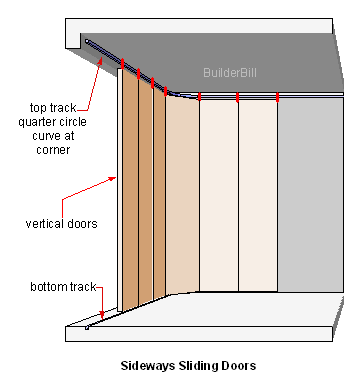 By definition, garage doors have to be wide enough to drive a car or other vehicle through with safety. In the early days of automobiles any type of the wooden doors could have been used. Large double batten doors hung on band and gudgeon hinges were common. It is true that almost any type of door can be used for small garages, but home-made or joinery shop doors just can't compete with the modern factory built products, in price and feature range. The last fifty years or so has seen the rise of many specialist garage door manufacturers. They produce a wide variety of doors that range from traditional timber to heavy industrial steel versions. The crop of modern doors have many advantages over the old sagging wooden doors of the past. They save space. Swinging doors take up space in front of the garage or inside it. Modern doors come in packages of supply and install. No need to look for tradesmen to fix them. They come with opening mechanisms. Able to be triggered from inside the car, so no need to get out of the car to open the doors in bad weather. Like most external doors they can be enhanced with extra security features. The variety of choices is huge as also is the price ranges. 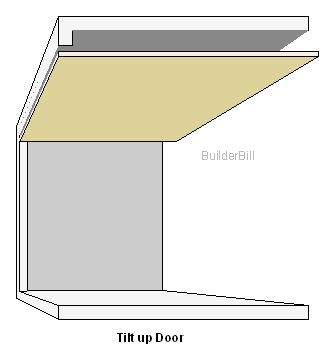 Above is popular choice of garage door that is made out of panels and slides up and along the underside of the ceiling. See the overhead panel door page for more details. 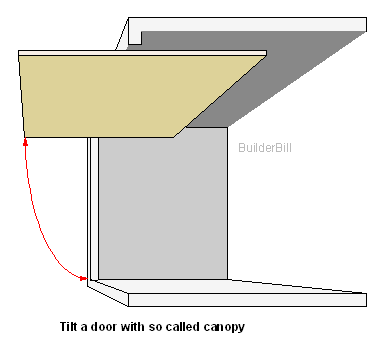 What you see above is the open position of a simple overhead door that some manufacturers call a canopy door. These doors are usually very lightly constructed and they are hinged on pivoting brackets mounted on the side walls or brackets to the wall around the opening. Large springs take a percentage of the weight of the door to make lifting it up into the overhead position fairly easy. Note! This type of door does need extra space in front of it, Unlike the roller door above. I have no practical experience with these "up and over doors" for one very simple reason. None of them satisfy the requirements of the building code where I live. I have no doubt that there are models and manufacturers out there that are producing good quality doors of this type, but I know for sure that there are a lot of dangerous doors still around. They have been known to drop quickly in gusts of wind and there are many instances of the springs breaking. 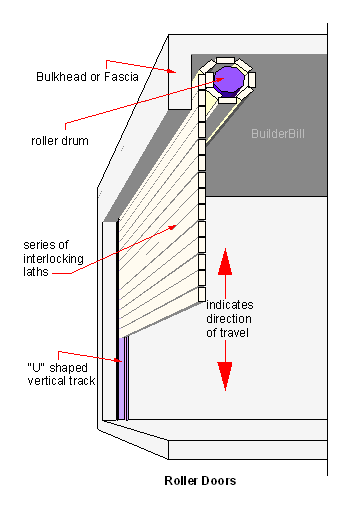 When the door is in the closed position the springs are stretched out at their maximum and a loose end could fly about. One trick with these is to thread a length of galvanised steel rope, say 6mm diameter through the length of spring. Put a thimble or eye on each end and bolt it to the door. That way in the event of a spring break it can't fly very far. So we warned if you are in the market for one of these doors. Another variation or the tilting door. This time the door fits totally inside the garage when it is open. Many of these doors use a pulley and a counterweight system to help in balancing the weight of the door. Some of the top range ones have automatic opening. These doors slide sideways like normal sliders and they turn a corner and get parked along a side wall when they are open. Again depending on the manufacturer and the fittings, these also can be automatic.